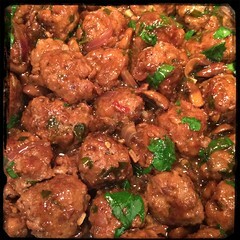 Inspired by those cocktail ‘Swedish’ meatballs that have become all the rage at pot-luck holiday parties we present our version, Mini Meatballs with Mushrooms. This dish can be used for a regular meal or pot-luck dinners. 1. In 2-3 tbsp of olive oil and 1 tbsp bacon fat, cook the meatballs. 2. When the meatballs are browned on all sides add the onions and Peperoncino Fiocchi (hot pepper flakes). When the onions begin to turn translucent add the diced garlic and cook until tender. 6. let cook for 5-10 minutes and add salt and pepper if needed (probably doesn’t). 7. Add the tbsp of cornstarch to help thicken the gravy.